Vietnamese authorities have applied several tough measures including sacking contractors in order to speed up important infrastructure projects. HCM City authorities have sacked the winning contractor for the Phu My Bridge Project after it asked for advanced funding and increased estimates for the project’s investment several times, yet continued to fail to meet its construction schedule. Phu My Bridge, a major HCM City infrastructure project was inaugurated September 2009. However, investors, the Phu My Construction Investment Corporation (PMC) claimed it could not recoup its investment from toll fees alone. Under the BOT (Build-Operate-Transfer) contract signed between the municipal government and PMC, the investor was tasked with raising capital from other sources for the bridge’s construction. It will be allowed to collect tolls for 26 years from when the bridge starts operation. However, after just a year, PMC has found it too difficult to recoup its investment and repay its bank loans based on modest toll fees. To deal with the problems, the investor was seeking approval from the city government to collect tolls from two-wheeled vehicles to offset its spending, but its proposal faced public opposition. PMC proposed that the municipal government allow the company to hike the toll but this was turned down. PMC continues to bemoan the difficulties it faces, including modest toll revenues due to fewer vehicles than expected, a doubling in the project’s investment, foreign exchange rate fluctuations and soaring interest rates. In order to ease pressures on the investor, the municipal government decided to use VND120 billion (USD5.75 million) from the city’s budget as an advance to PMC to settle its debts to foreign banks, bringing total funding advanced to the firm to VND220 billion (USD10.55 million). However, PMC still required an increase in the project’s investment to VND3.402 trillion (USD163.16 million), from a previous VND1.805 trillion (USD86.57 million) in order to prolong the toll collection period. However the investor failed to repair a road connecting to the bridge. 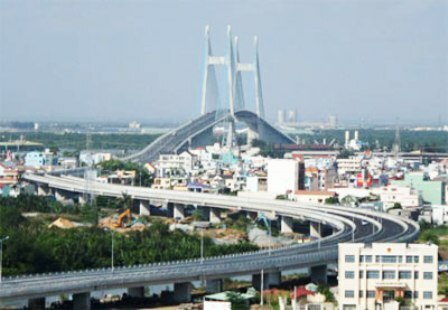 In order to pressurise the municipal government to approve its debt, in the middle of 2011 PMC had announced that it would return the Phu My Bridge to the city if its demands were turned down. Despite Phu My Bridge being completed over two years ago, construction of a belt road at the eastern half is currently at a standstill. Faced with no other options, the municipal government has agreed to take the project back and will return all investment to the investor, instead of facing a series of requests. Deputy Prime Minister Hoang Trung Hai has requested that construction of Nhat Tan Bridge must be completed by September 2014 while the second terminal at Hanoi’s Noi Bai airport must be finished by December of the same year. After carrying out an inspection of these major infrastructure projects, Hai stated that the projects could be completed over 20 months later than initially scheduled. In order to improve the situation, the Deputy PM requested the Ministry of Transport (MOT) to prioritise capital for these projects between 2012 and 2015. Hanoi’s municipal government was told to advance VND400 billion (USD19.18 million) from the city’s budget to heighten site clearance for these projects. Hai required Dong Anh District People’s Commitee to apply supporting measures to ensure site clearance for the northern part of the bridge before March 15 and Tay Ho District must finish the work for the southern part of the bridge prior to March 31, 2012. The MOT was also requested to speed up auctions for remaining bidding packages for the construction of a road section linking Noi Bai Airport with Nhat Tan Bridge to ensure its construction will start in May 2012. Cleared sites must be presented to the investor before April 30 this year. Concerning Noi Bai Terminal 2, the municipal government must hasten the relocation of agencies and households in the project site as well the construction of resettlement areas. The city’s government is responsible to direct Soc Son District People’s Committee to complete site clearance for the building of a petrol station for the terminal as well as the project site in Phu Cuong Commune before March 31, 2012. Construction of 3.8-kilometre Nhat Tan Bridge started in the fourth quarter of 2004 with a total investment of VND2.3 trillion (USD110.31 million). It was expected to be completed in 2007. 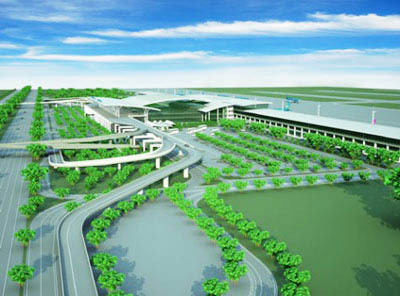 The 14-hectare T2 terminal will cost nearly USD900 million. It is expected to become operational after 34-month construction following the groundbreaking in December 2011, and will serve 10 million passengers per year.